Another stark reminder of the dangers faced by political cartoonists around the world, particularly in the Middle East, was brought up in a recent article by the New Statesman’s Anoosh Chakelian. Cartoonists who refuse to self-censor are often forced to choose between fleeing the country or living in constant fear of physical or legal repercussions from extremists, government officials, or both. Syrian Ali Ferzat is a prime example of a cartoonist who has experienced both retaliation and exile. 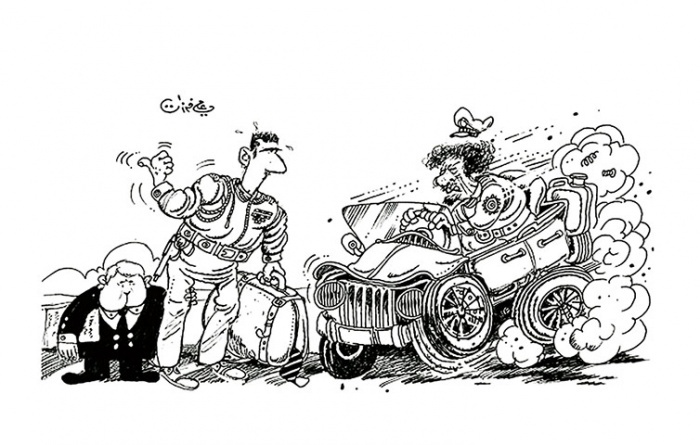 In 2011 when Libya’s regime was crumbling and it looked like Syria might follow, Ferzat drew the cartoon shown here which encouraged dictator Bashar al-Assad to hitch a ride out of town with Muammar Gaddafi. Shortly thereafter Ferzat was brutally beaten by members of a militia that supported Assad. The assailants broke both of his hands, just to make sure he received the message that he should quit drawing. Instead he fled to Kuwait, where he continues drawing to this day. Two Iranian cartoonists featured in Chakelian’s article were separately forced into exile as well. Mana Neyestani was imprisoned in 2006 after he drew a children’s cartoon which depicted a cockroach speaking the Azeri language. The cartoon touched off riots across Iran among ethnic Azeris who felt they had been insulted. Trying to soothe tensions, the government temporarily banned the newspaper which had published the cartoon and arrested its editor as well as Neyestani. The cartoonist managed to escape the country while on temporary release from prison and eventually received asylum in France. His graphic novel An Iranian Metamorphosis chronicles the surreal experience. Neyestani’s countryman Kianoush Ramezani was luckier in that he managed to flee before the government could arrest him–but after they had arrested several of his friends. In his opinion, any cartoonist who self-censors in order to keep working is “not a cartoonist. You do propaganda for a regime.” Ramezani also now lives in France and organizes an annual exposition called Sketch Freedom, featuring cartoonists whose work “manifest[s] the value of freedom of expression.” In fact, the second Sketch Freedom started yesterday in Gothenburg, Sweden, presenting an international collection of art by 28 cartoonists including Bonil and Zunar. We recommend they have what we call a ‘bail bag’: a suitcase with an airline ticket in it, $1,000, a way to get out quickly, or to go to a safe house easily . . . collect their most trusted friends and relatives and be prepared to disappear for a while. Russell adds that cartoonists often face threats both from the government and from private actors, saying “it just depends who the cartoonist is bothering that day.” Ferzat, for instance, still doesn’t know if Assad actually ordered the attack on him–but he wasn’t about to stick around to find out. To recognize all the courageous gadflies who plug away in an underappreciated medium at great personal risk, we will definitely be celebrating World Cartoonists Day next January 7!